Determination how best badminton is an important element in making a decision to choose kok in badminton game, where from many kok we can choose the best. Misinformation kok will be bad in badminton game. The decision taken can be in the form of weight determination, diameter kok, kok size, hair length kok, kok material, color label kok, brand kok, kok speed, endurance kok. Badminton players need to know which one is best among how many are used. Fuzzy logic mamdani is one method that is very flexible and has tolerance on existing data. Fuzzy mamdani has the advantage that is, more intuitive, accepted by many parties. The use of fuzzy mamdani is the same as the use of forecasting methods in the field of statistics. Determination of analysis based on fuzzy approach is more efficient in approach using numbers than with forecasting method. Forecasting in statistics can result in error errors greater than the fuzzy approach. Therefore with the existence of this system can help the process of determining the best kok faster. And also the accuracy will be more assured where the determination to include the factors that support. In addition, the system must have a basic calculation calculation is good, one of the basic calculation calculation is good and can be used is fuzzy logic using mamdani method. “Aplikasi Logika Fuzzy Metode Mamdani dalam Pengambilan Keputusan Penentuan Jumlah Produksi,” no. April, 2016. R. Meimaharani et al., “ANALISIS SISTEM INFERENCE FUZZY SUGENO DALAM MENENTUKAN,” vol. 5, no. 1, pp. 89–96, 2014. S. R. Andani, “FUZZY MAMDANI DALAM MENENTUKAN TINGKAT,” vol. 2013, no. semnasIF, pp. 57–65, 2013. A. Saepullah, “Comparative Analysis of Mamdani , Sugeno And Tsukamoto Method of Fuzzy Inference System for Air Conditioner Energy Saving,” vol. 1, no. 2, pp. 143–147, 2015. A. Bahroini, A. Farmadi, and R. A. Nugroho, “PREDIKSI PERMINTAAN PRODUK MIE INSTAN DENGAN METODE FUZZY TAKAGI-SUGENO,” vol. 3, no. 2, pp. 220–230, 2016. A. D. Putri, “Fuzzy Logic Untuk Menentukan Lokasi Kios Terbaik Di Kepri Mall Dengan Menggunakan Metode Sugeno Kecerdasan Buatan ( Artificial Intelligence ),” vol. 1. Y. Charolina, “SISTEM PENDUKUNG KEPUTUSAN UNTUK MENENTUKAN PEMBERIAN BONUS TAHUNAN MENGGUNAKAN METODE FUZZY LOGIC TIPE MAMDANI ( Studi Kasus Pada Karyawan PT . Sunhope Indonesia Di Jakarta ),” vol. 12, pp. 42–53, 2016. I. Sunoto, P. Studi, T. Informatika, P. Studi, and T. Informatika, “MOTOR BEKAS DENGAN PENDEKATAN LOGIKA FUZZY INFRENCE,” vol. 6, no. 2, pp. 305–314, 2015. A. Y. Yudanto, M. Apriyadi, K. Sanjaya, A. P. Waktu, L. Hijau, and Y. Kurang, “Optimalisasi Lampu Lalu Lintas dengan Fuzzy Logic,” vol. V, no. 2, pp. 58–62, 2013. J. Teknika and A. Bachri, “PEMBELAJARAN SISTEM KONTROL DENGAN APLIKASI,” vol. 2, no. 2, 2010. HANDOKO, Koko Handoko; FAJRIN, Allfannisa Annurrrullah. PENERAPAN LOGIKA FUZZY MAMDANI MENENTUKAN KOK TERBAIK BULUTANGKIS. 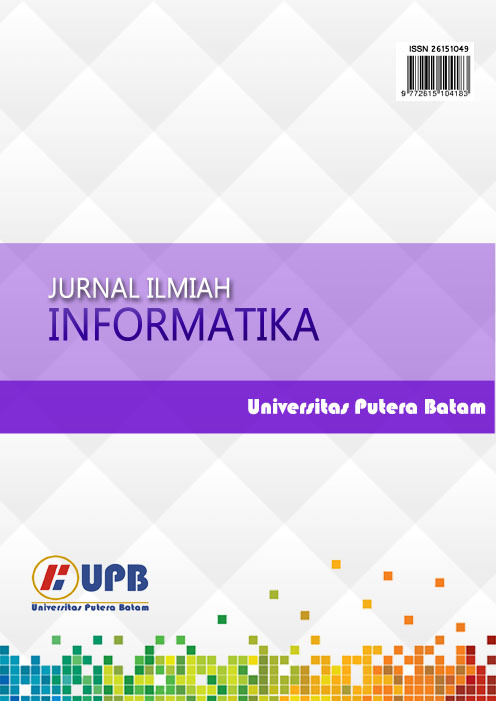 JURNAL ILMIAH INFORMATIKA, [S.l. ], v. 6, n. 02, p. 35-42, sep. 2018. ISSN 2615-1049. Available at: <http://ejournal.upbatam.ac.id/index.php/jif/article/view/604>. Date accessed: 23 apr. 2019.